"Not Ourselves, but the Cause." Idaho's State President recieving Idaho's charter from the National Organizer in 2002. Idaho is one of the newer member states of the National Society, Daughters of the British Empire in the USA, having received its charter in early 2002. We have two chapters, the Crown Jewels Chapter and the Tea Rose Chapter, which are both based in, or near, Boise, the state capital. DBE in Idaho is part of the Western District and, as such, supports the British Home in Sierra Madre, California. The State Board host fund drives, such as Pub Night, where we present a trivia quiz (with prizes) and serve a traditional pub dinner and dessert. As an ongoing fundraising effort we have also published a cookbook, "A Treasury of Recipes". The proceeds from these State fund drives go into our administration fund. DBE in Idaho was first formed in 1927. 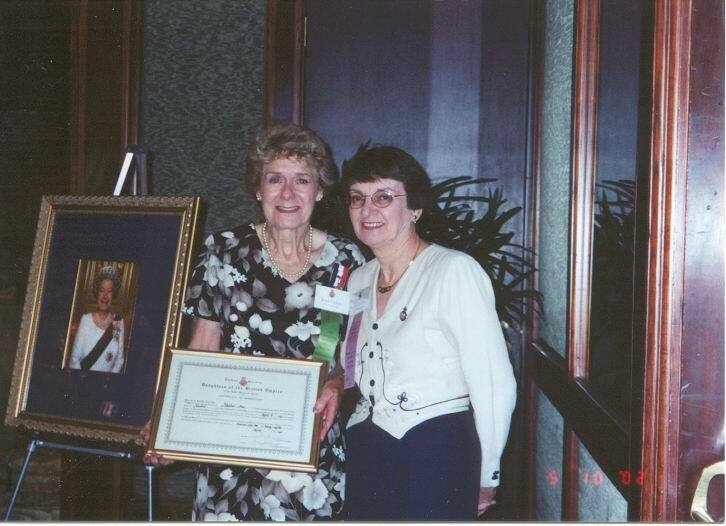 There were two chapters: the Lincoln Chapter in Boise and the Princess Margaret Rose Chapter in Idaho Falls. The state's charter lapsed in the 1940s, but meetings were still held well into the 1950s. 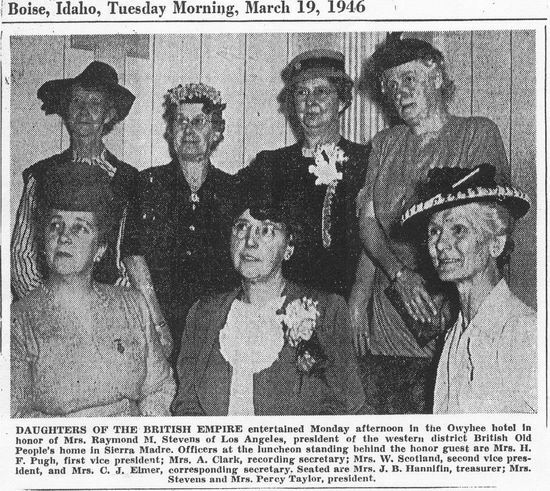 If you, or anyone you know, belonged to the first DBE in Idaho, or if you have any historical information about it, we would love to hear from you! Copyright 2018 Daughters of the British Empire in Idaho, Inc.. All rights reserved.